Combining observations done with ESO's Very Large Telescope and NASA's Chandra X-ray telescope, astronomers have uncovered the most powerful pair of jets ever seen from a stellar black hole. The black hole blows a huge bubble of hot gas, 1,000 light-years across or twice as large and tens of times more powerful than the other such microquasars. 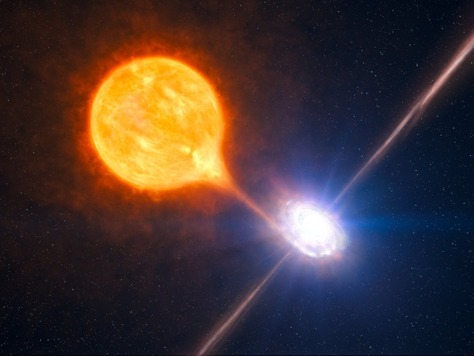 The stellar black hole belongs to a binary system as pictured in this artist’s impression.